I read you every time you update as you're in my reader :) I love your creations!!! Happy Holidays!! So Bunny - Congratulations!! - send me an e-mail ([email protected]) with your address and I'll get that package right out to you! And thank you all for your wonderful supportive comments of my blog - they really made my week! First up for my projects to show you today is my card for the Inspiration challenge on Split Coast. Stef chose another fun ETSY site 'Block Party Press'. 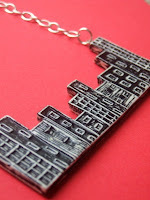 I chose this fun city scape necklace for inspiration. I immediately thought of this Amuse city scape stamp that I stamped 3 times and embossed in silver. I adhered it with foam dimensionals and cut it to fit the full width of the card. I didn't use my embossing buddy before embossing the sentiment (Vippies)so the little extra flecks that stick with the static would look like stars in the sky. The embossed stars are from the Take a Bough set from Papertrey Ink. I embossed the large star with silver on black, cut it out and adhered it with a foam dimensionals. And next I want to share a couple of fun Christmas crafts I found while surfing some blogs. I found this cute idea for pops at this site although Ashley made them for candy canes. We're having a Christmas craft sale at church and I thought these dressed up our yummy chocolate/rice crispy lollipops that Jeannine made. 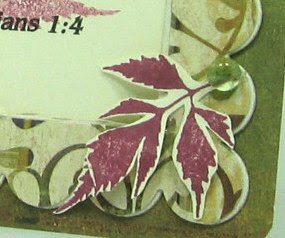 The stamp I used here is from Papertrey's 2008 Holiday Tag collection with Ripe Avacado Ink from PTI. Next up is this adorable little coaster frame for pictures with Santa (or any picture!) that I found on Lorri's blog here. I added a picture of my sister Marcia and me (I'm on the left age 4!) Could my bangs be ANY shorter?!?!? The picture is just clipped on so the purchaser can remove it and slip their photo right on. I used a heavy weight coaster for this and covered it with designer paper from SU. I punched a tag (Pure Poppy PTI) and stamped Merry Christmas from the All I Want for Christmas sentiment set by H&M Stamps on it. I attached the tag to a white card stock rectangle (2 1/2 x 3 1/2) and attached that to the covered coaster. The belt is 1/2" black grosgrain ribbon and the belt buckle is made from a 1" square of Summer Sunrise card stock (PTI) I punched two slots on it using the slot punch from Stampin Up to slide the ribbon through. Lorri had attached magnets to the back of her coasters - but I made an easel stand for mine using a piece of coaster as shown. I scored it to allow it to bend and attached it with Scotch Quick Dry Adhesive - that's also what I used to attach the DP to the coaster. Today I am so thankful that we have heat and electicity - we had terrible icing north and west of us on Thursday night (we just had torrential rain where I live) and my son lost his utilities at his condo so came with April and his two dogs to stay overnight with us (power was restored today to them) - and my sister lost her utilities and a giant tree branch fell on her car and blew out the back window crushing the trunk. Another beautiful birch tree out front came up by the roots and fell against their roof! But we are thankful there was no damage to her house or to them personally. They have been told their power may be out for 4-5 days so they hurried out to by a power generator - luckily they have a wood stove and running water. Thank you so much for stopping by. I hope you are inspired by my crafts today to make some of your own! I created this coaster frame for the Divine Design challenge on Splitcoast. 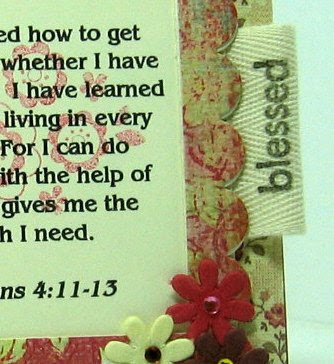 Every month you choose a Bible Verse to memorize and make a card or project using that verse. I love this verse from 2 Corinthians - it reminds me that not only can I get comfort from God - but I can also give that comfort to others through my faith. I used Amy Rysavy's great tutorial to create this frame. Added NOTE: You have to use the light coasters with your Nestabilities and cuttlebug to cut these and I get the coasters at Eclectic Paperie. 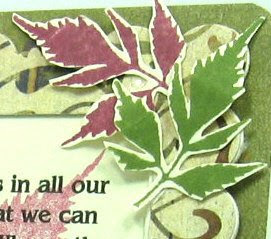 I used a newly released stamp set from Artful INKables called Plant Prints. I off stamped the large fern before stamping it over the computer generated verse so that it wouldn't be too dark over the words. I stamped and cut out several of the smaller fern stamp in the set, curled the fronds on my finger and attached them to the corners. I added Dew Drops to 3 of the corners. You'll see on Amy's tutorial how you cut a piece from the square that you punch out of the front to make an eisel to hold up the frame on the back. You could also attach a piece of magnet and hang this on your fridge or metal cabinet. You can see my other coaster frames here. Kristin is offering 10% off all stamp sets over at Artful INKables for the month of July - so be sure to hop over there and get your order in!! We went to a craft fair at Gunstock Mountain on Sunday. We rode the chair lift up the mountain. This is a view of Lake Winnepsaukee, NH on our way down. I always search out the potter booths - this guy was having his first show. And these are my purchases from him - a toothbrush holder that I'm going to use to hold pens, brushes, etc on my work table - and a sponge holder for the kitchen sink area - I bought one of these last year and it is just super to hold the sponge up so it dries out in between uses. 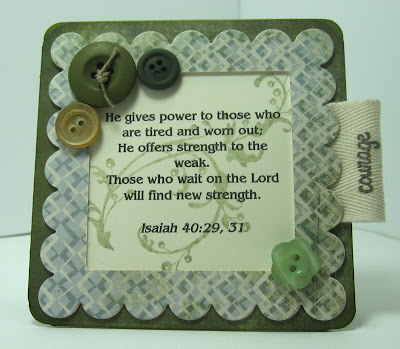 This is my June Bible Verse submission for the Divine Design Monthly challenge on Splitcoast. Last month and this month I made mine a frame so I can stand it up on my desk at work or my counter at home where I will see it every day for the month. The idea of the challenge is that you will memorize your verse each month and that way become more familiar with the Bible. I chose this Bible verse because it reminds me to be happy where I am and with what I have. We really already have everything we need if we allow God to be in our lives. I used 2 coasters and my nestabilities to create this pretty frame. The back piece is covered with My Mind's Eye - Wild Asparagas/Baby Girl Floral and the front scalloped piece is My Mind's Eye - 29th St. Market/Beautiful Blossoms. The verse is computer generated and I overstamped it with a cute flower stamp from Imaginesce. My cuttlebug will cut through this THIN coaster with the Nestabilities (don't use med or thick coasters). It takes a couple of passes through but works well. I found this wonderful tutorial for making these here on Amy Rysavy's blog. There is a kickstand piece on the back so that it stands up or you could put a magnet on the back to attach it to your fridge or file cabinet. The "blessed" is from the PTI set Papertray and is stamped on a piece of wide twill with Onyx Black Versafine ink. 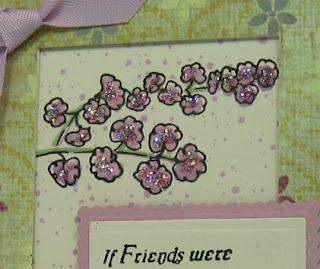 The flowers added in the corners are Jeweled Florettes by Petaloo. 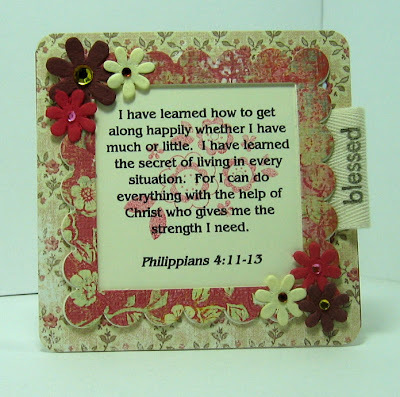 You can see my June Bible Verse frame here and my 4x4 Bible verse cards here. Thanks so much for spending part of your day with me today! I participate in a monthly challenge called Divine Design 2008 Bible Verse Challenge where every month we create a card or project with a Bible Verse on it - the intention being that we will memorize these verses to broaden our knowledge and appreciation of the strength we can gain from such an exercise. This is the project I created for May. On Split Coast we are often asked to send out a card to someone who could use a boost and more often than not - the person is suffering from cancer. It is so hard to know how to comfort that person in a card. I felt this verse would do just that. 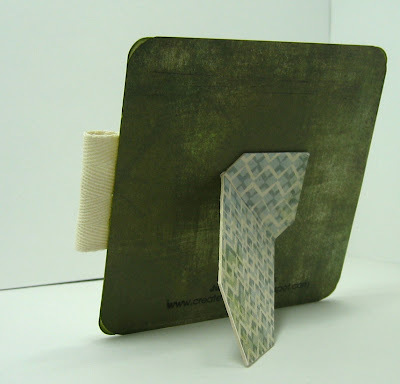 This also qualifies for today's Ways to Use It Challenge - to use chipboard on a card/project. I used 2 coasters and my nestabilities to create this pretty frame that I covered with Basic Grey Archaic DP. You use your corner punch on the DP so it fits on the chipboard and sponge the edges to match the DP. The cuttlebug will cut through this THIN coaster (you can't use med or thick as that will not cut). It takes a couple of passes through the machine but it works well. I found a wonderful tutorial for making this frame here on Amy Rysavy's blog. I stamped over the computer generated verse with the vine stamp from Basic Grey Figgy Pudding Winterland clear set. I inked the stamp - off stamped it on a piece of paper - then stamped over the sentiment so that the ink was light and didn't obscure the verse. There is a kickstand piece on the back so that it stands up or you could put a magnet on the back to attach it to your fridge or file cabinet. I cut a 2.5 inch square inside the large Scalloped square so I had enough room for the verse. Here you see the kickstand on the back - which is made from the square piece that was left when you cut the frame. You trim the sides and then score one end and attach it to the back as shown. I used Scotch Quick Dry Adhesive to attach the papers, the sentiment and the kickstand. The buttons are attached using glue dots. Here is a side view showing the kickstand. 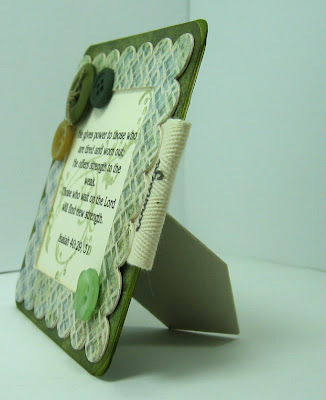 You can see my other Bible Verse Cards on this post. Thanks for coming by to see my offering today. Tomorrow night we're going to see a play so I won't be back here until Saturday - hopefully I'll be posting my origami flower place cards - wait till you see how cute they are! Todays thought from Poor Richard's Almanac by Ben Franklin: "All would live long, but none would be old."